Step 2: Create AEROBATIC_API_KEY environment variable. 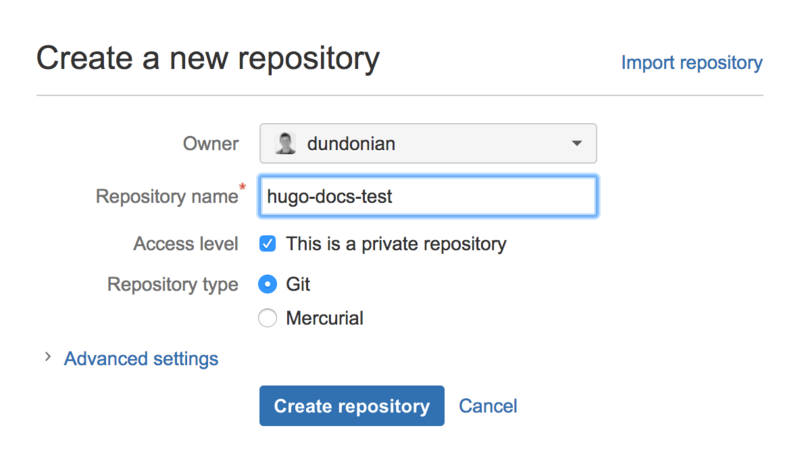 You can use Bitbucket in conjunction with Aerobatic to build, deploy, and host a Hugo website. You can use Bitbucket and Aerobatic to build, deploy, and host a Hugo website. Aerobatic is a static hosting service that integrates with Bitbucket and provides a free hosting tier. If you haven’t previously used Aerobatic, you’ll first need to install the Command Line Interface (CLI) and create an account. For a list of all commands available, see the Aerobatic CLI docs. In the rendered page response, the https://__baseurl__ will be replaced with your actual site url (in this example, https://my-new-hugo-site.aerobatic.io). You can always rename your Aerobatic website with the aero rename command. We will now create a git repository and then push our code to Bitbucket. In Bitbucket, create a repository. In the example above, we pushed the compiled assets in the /public folder to Aerobatic. In the following example, we use Bitbucket Pipelines to continuously create and deploy the compiled assets to Aerobatic. Click the Pipelines link in the left nav menu of your Bitbucket repository. Click the Enable Pipelines button. On the next screen, leave the default template and click Next. In the editor, paste in the yaml contents below and click Commit. Navigate to the Bitbucket account settings for the account that the website repo belongs to. Scroll down to the bottom of the left nav and click the Environment variables link in the PIPELINES section. Create a new environment variable called AEROBATIC_API_KEY with the value you got by running the aero apikey command. Be sure to click the Secured checkbox. git commit -m "New blog post"
Your code will be committed to Bitbucket, Bitbucket Pipelines will run your build, and a new version of your site will be deployed to Aerobatic. 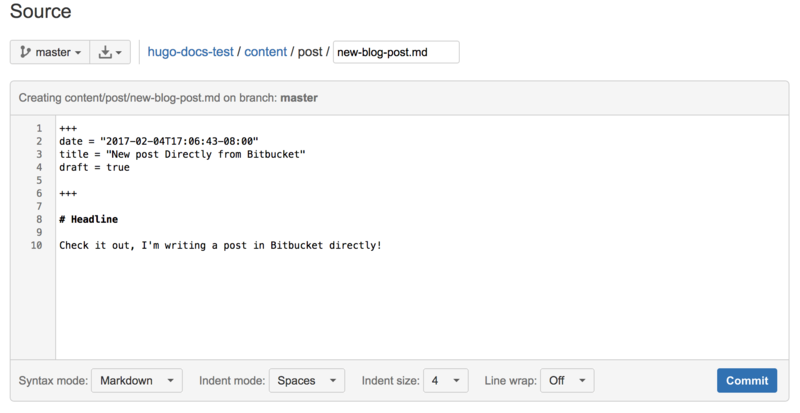 At this point, you can now create and edit blog posts directly in the Bitbucket UI. The code for this example can be found in this Bitbucket repository. Aerobatic also provides a number of additional plugins such as auth and redirects that you can use for your Hugo site.